Filipinas Heritage Library | Where is the Humanity? 30 Apr Where is the Humanity? 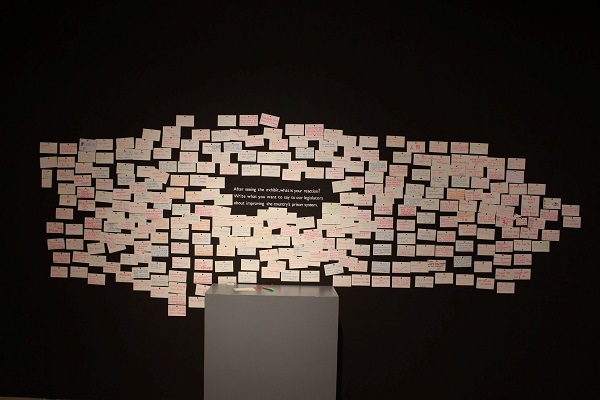 Among the 602 answers from the Filipino and international community on the freedom wall assembled at Rick Rocamora’s photography exhibit entitled, Bursting at the Seams: Philippine Detention Centers, this was the question often asked. Indeed, Rick Rocamora impeccably depicts the awful living conditions of the prisoners at present-day Philippine detention centers, specifically the lack of personal space, sufficient food and drinks and proper clothing. Hence, it is indubitable that this thought came into the minds of its visitors. Explicitly stated in the Preamble of the Philippine constitution, we must “build a just and humane society.” However, this was not the case in the photographs presented by Rick Rocamora. The responses highlighted this, as they have enumerated the problematic surroundings, namely the insufficient space for sleep and rest, inadequate allocation of food and drinks, and non-existent health care benefits. In this light, there was a constant juxtaposition between animals and prisoners. One respondent said that dogs and cats were even given better accommodations. Additionally, the centers were compared to pig pens, due to how unruly and shambolic it looked like. There were violent reactions towards the government, as to how the inmates were being treated. Numerous notes contained cuss words to certain government officials, such as to the former President Aquino and current President Duterte. They mentioned the need for the people in position to experience the brutality of the prisoners’ lives are, in order to realize the importance of prison reforms and of an improved judicial system. Further, multiple messages contained their dissatisfaction with the government, by emphasizing on the horrible state of Philippine prison that has not changed for the longest time. Despite the majority of the responses being in the negative light, there were messages of hopefulness. Some gave suggestions on how to improve the situation of the inmates, by focusing on their welfare and development, by way of implementing activities that will improve their capabilities and talents. Once out of prison, they must be able to be productive members of the society, and this should be imparted by the management of the detention centers. As a suggestion by a respondent, this could be done through agricultural education, which is one of the main economic sources of the country. Because of the disturbing images, many respondents were disappointed and shocked on the existing situation of the Philippine jails. Questions like “what happened to our country?” and comments such as “we have a lot to be proud of as Filipinos, but this one makes me so ashamed to be one” are incredibly upsetting. Nevertheless, this unfortunate situation did not hinder the well-known Filipino spirit to prosper, as a handful of respondents expressed their willingness to help ensure the improvement of the prisons. EDIT: On September 2018, the Filipinas Heritage Library and Ayala Museum won at this year’s Leading Culture Destinations Awards (LCDA) in London for this exhibition. Read more about it here.